Just in time to snap the end Superliner coaches of the Amtrak Empire Builder at the Java bridge over US 2 in a summer shower. The activities you download and run can lose their sense of challenge after a time. What's needed is some variety! This page shows you how you can run different locos and rolling stock and alter the time and/or weather for any activity. A word of caution, however: changing the rolling stock in the default activities may lead to some confusion. However, it's possible - perhaps if you write down what makes up one of the default consists then you can later replace the original locos and rolling stock. The type of activities most suitable for change are the longer duration ones, such as those across Marias Pass or passenger runs on NEC. Shunting (switching) activities don't lend themselves so much to changing rolling stock, except perhaps for the loco you're driving, but changing the weather conditions or time of day can certainly add variety. For example, changing the time from night to day makes shunting that much easier! Note we're not changing any file names (i.e., file names of any consists nor any files associated with the activity); we're only changing the contents of a consist file. This means, as far as MSTS is concerned, nothing has changed. Consequently, when you save an activity, you can re-load it and resume the activity without MSTS having heart-palpitations. There is one condition to be observed here: don't alter the consist file, in fact, don't alter even the ENGine file between runs. It seems that when MSTS re-loads a saved activity, everything has to be as it was when you saved it. There is another way of altering an activity's consists to what's described here but MSTS gets upset and crashes when a saved activity is re-loaded. To run Activity Changer, you'll need the Java Runtime Environment, which is a free download at java.sun.com/j2se/1.3/jre/. 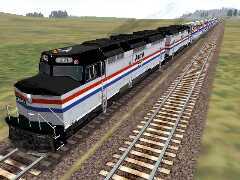 An Amtrak Mail & Express, led by a trio of dependable F40s, prepares to depart the yard. Start ConBuilder, choose Activities on the Program menu. Then choose the route and activity. ConBuilder lists all the consists for this activity. The first consist you can edit is the one marked [PLAYER]. Highlight this consist then click Send consist to editor. At this point, you may want to jot down what's in the consist so you can change back to the original some time in the future. Or, later if you want to restore the original, just re-install the activity, answering No to any overwrite queries until you see the name of the consist in question. You can now change locos and rolling stock to your heart's content. Remember to save; answer Yes to the Overwrite? query. Of course, you could choose to change the [TRAFFIC] consists. Choose Program/Activities again and ConBuilder takes you back to the list of consists for the activity. Beware, though, that the author of the activity may be using default consists from one or more of the default activities. If you're not sure, use ConBuilder to view the consists used by the default route activities. Authors of most activities now precede their files with a distinguishing two- or three-letter code for easy identification so that will help you decide whether you want to change a [TRAFFIC] consist. The Amtrak Empire Builder, on this occasion led by F40s on its way west, works up the grade near Spotted Robe. Although the download of the JRE is a necessity for ActivityChanger, that chore is minor in what variety can be made to your downloaded activities by being able to change the start time and/or the weather conditions. ActivityChanger backs up an activity's files so you can return the activity to its original form if you want. As well as making changes to time and weather, version 1.1 under the Tools menu enables you to read an activity's brief, view the timetable and edit it manually! As of version 1.1 ( but improved in version 1.4a), it's a bit difficult to know which activity you might want to edit. This occurs because ActivityChanger asks you firstly to choose from the routes you've installed, then to choose from the folder tree of that route. It isn't at first obvious, but you need to choose the Activities folder (it's at the top; scroll up if need be). Then you are looking at the list of activity (ACT) files in that folder, as they were named by the activity's author. After choosing a file to open, you can view details about the activity: it's name, weather setting, and so on. As well, you can use the Tools menu. It's easy to make changes: enter a new starting time and if you want to change the weather, click on the radio buttons as appropriate. Save and you're away! 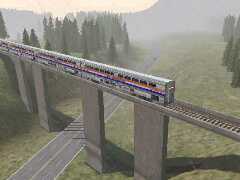 Note that ActivityChanger's author, Torben Speigler, posted on the Train-Sim.com forum a few days ago that he was adding more features in a new version, including the ability to use consists from other activities. Visit his site at http://msts.juliane-und-torben.de for the latest news.